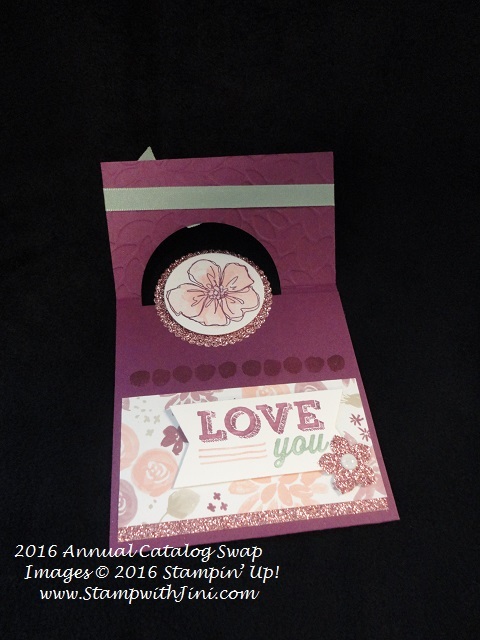 This beautiful stamp set is one of our Sale-a-bration offerings that you can earn for FREE during Sale-a-bration with a qualifying order. 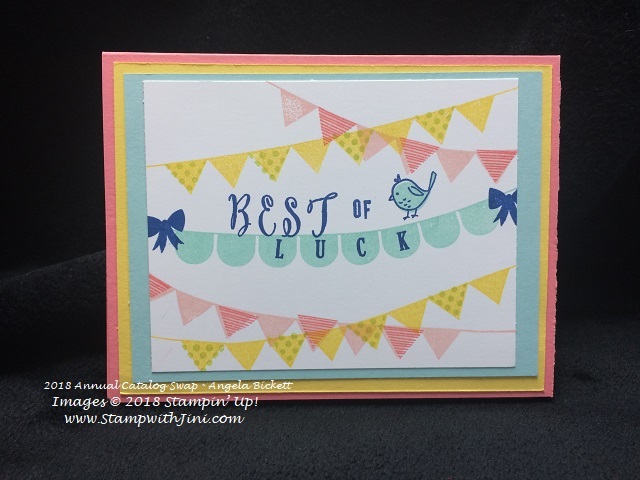 The font is very pretty and the set has wonderful sentiments that will fit in a variety of our punches and dies which makes it a great choice too! Check out these cards created with this stamp set. 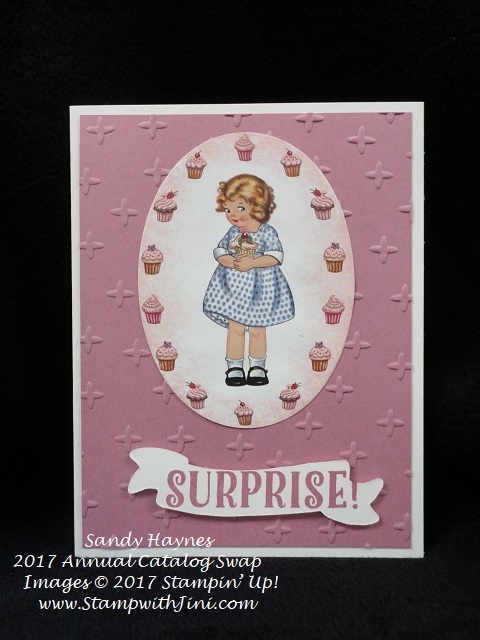 These first few use the Gingham Gala Designer Series Paper. 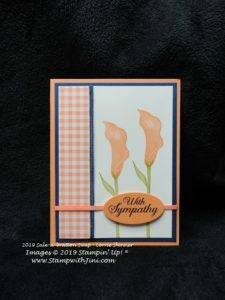 And this one is done with a combination of Calypso Coral and Soft Sea Foam. So what do you think? Which is your favorite? I can’t pick one. Can you? 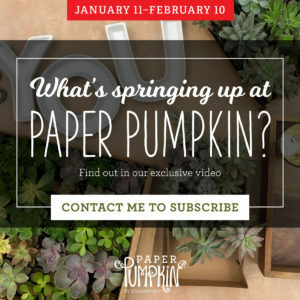 Why not leave me a comment and let me know? Want a 2019 Occasions & Salabration catalog of your own? 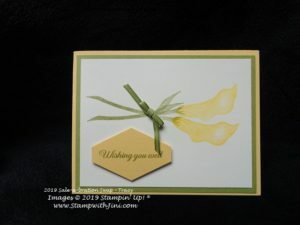 Why not contact me (StampwithJini@gmail.com or call 706 754-7124) I can mail you one. All I need is your full name, address and phone number. 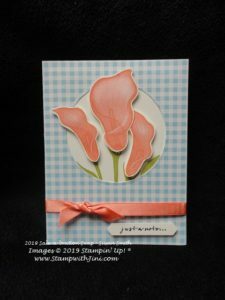 Have you seen the Pick a Pennant stamp set? 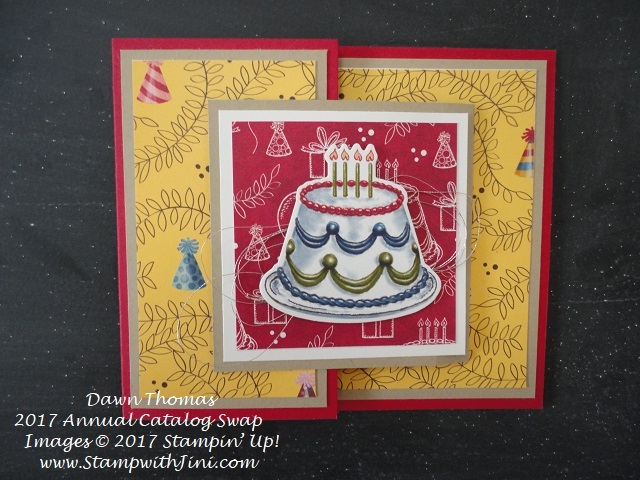 It’s one of those sets that is packed with tons of stamps – 76 to be exact and lot’s of options too. 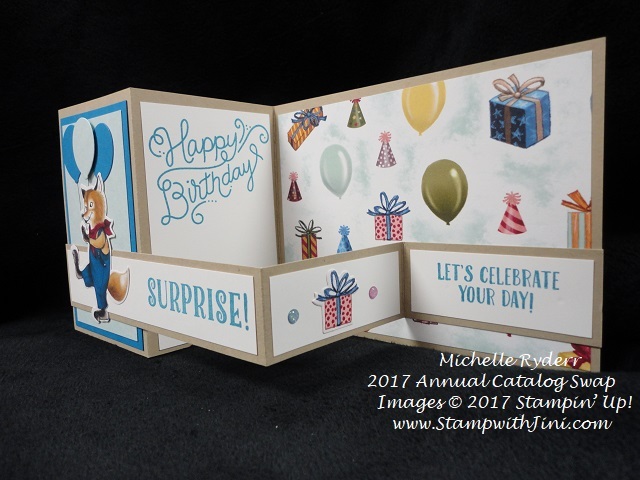 It’s also great to use with our Stamparatus since it’s photopolymer and once you set it up you’re set to do multiple cards. 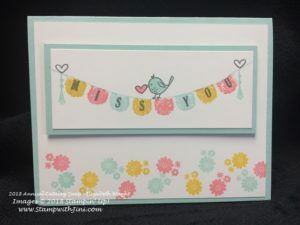 Check out some of these cards using the Pick a Pennant stamp set – as you can see the little bird is a favorite! 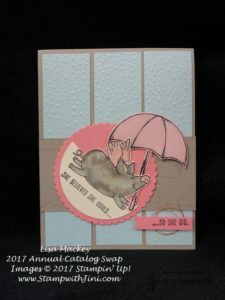 I’ve included the supply list below for this first card. And did you know that this set also comes with a coordinating framelits dies? 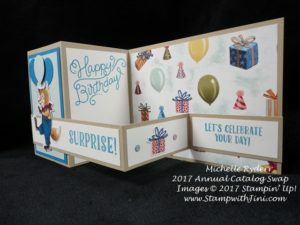 The Playful Pennants Framelits Dies (146352) will give you even more options and it comes in a money saving bundle too! So now you can save 10% when you order the Pick a Pennant Bundle (148393). 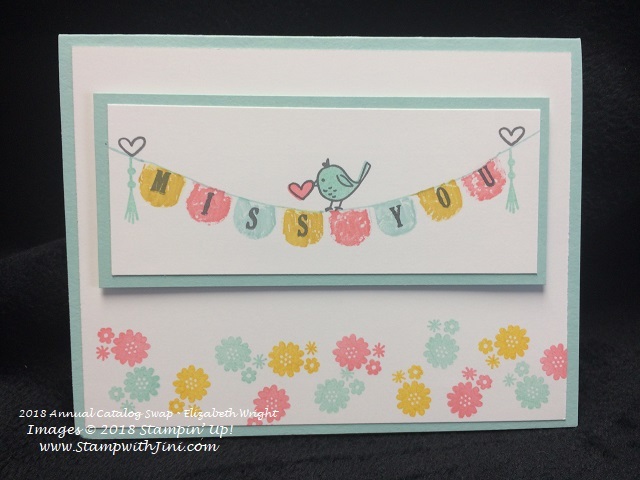 Want an adorable set with wonderful sentiments? 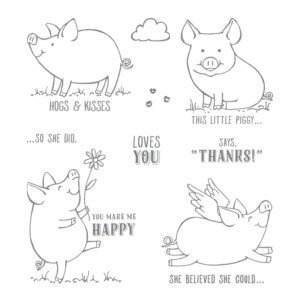 Why not take a look at the This Little Piggy stamp set found on page 48 of the 2017 Annual Catalog. I fell in love with it as soon as I saw it! 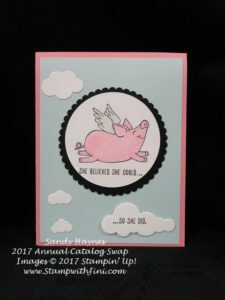 It has both adorable images – and for some reason, it brings to mind one of my favorite childhood movies, Charlotte’s Web. 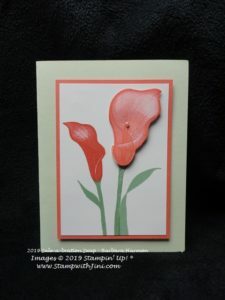 Check out these wonderful cards using this set that I received in my recent swap. 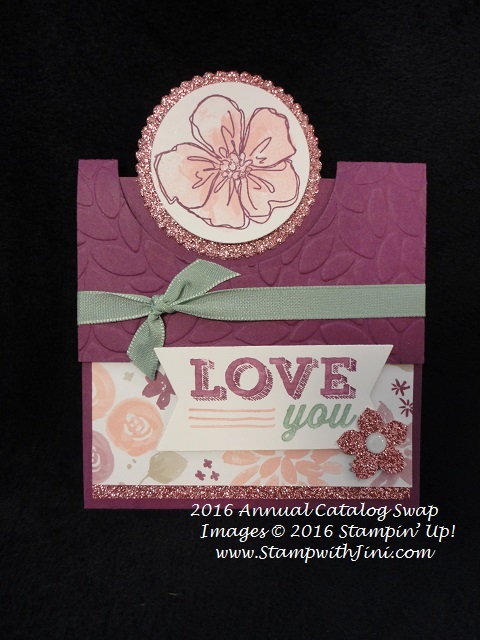 Stop by again tomorrow when I’ll be sharing some more wonderful swaps with you! Shop at my Online Store and use Hostess Code GD4KM4GZ during June and receive a free gift from me! 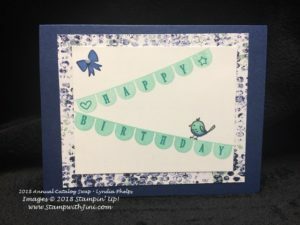 The Birthday Memories Suite of products is really quite cool. 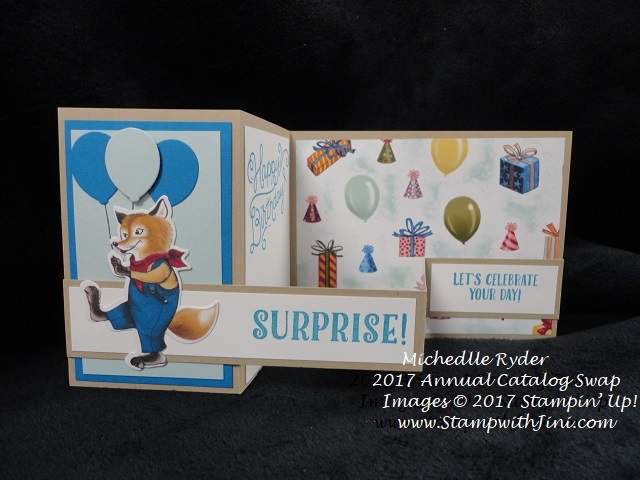 Not only does it include as great bundle of stamps and Framelits Dies, Honeycomb Balloon Embellishments, ribbon and Designer Series Paper, but the Framelits cut out images from the Designer Series Paper! Like I said cool right? I shared this card back in April with you (HERE) after attending our On Stage event in Savannah where we not only cut out the image but stamped the sentiment – The Birthday Memories Designer Series Paper is sized perfectly to work with the stamps too! I’ve given you the complete supply list for this card below. If you love these coordinating products you’ll love the fact that Stampin’ Up! 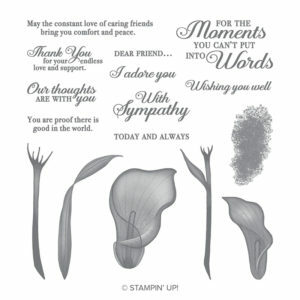 has given us a bundle of products that contains not only the stamps and Framelits dies, but also the Designer Series paper. 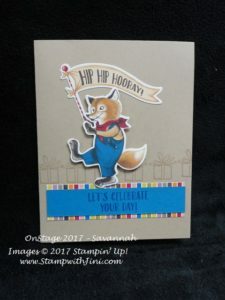 Whoo hoo! 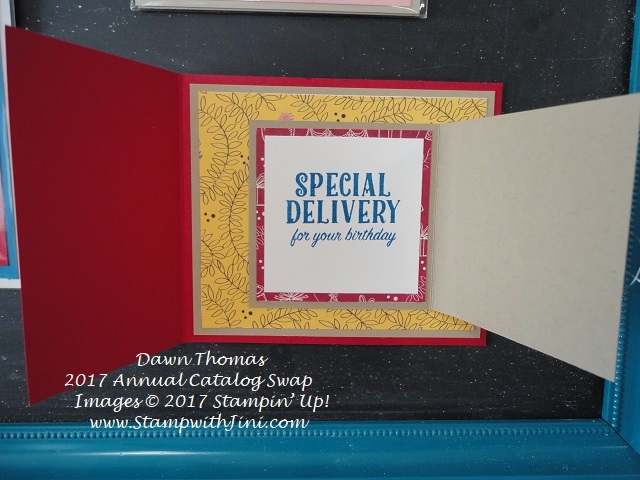 Save 10% on all 3 items when you purchase the Birthday Delivery Bundle (145294)! 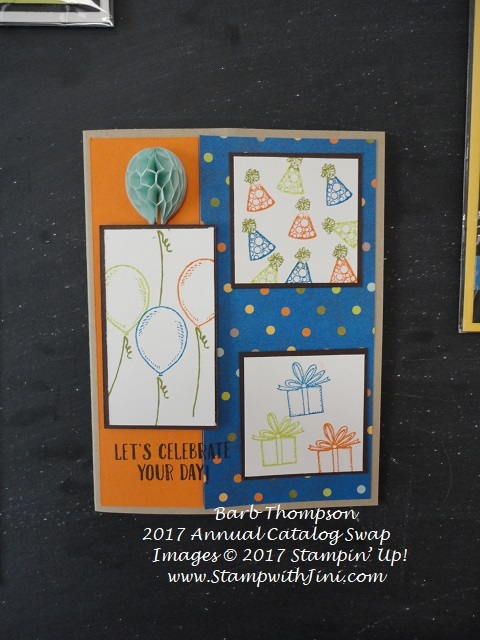 Now would you like to see some more cards made with this fun product suite that I received in my recent swap? While they all use the same products they have such different looks and feels to them. 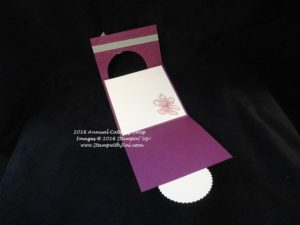 Who doesn’t love the little Balloon Honeycomb Embellishments (144124) on this card? It’s fun and it’s so cute! And this fun fancy fold card – bright, bold and colorful. 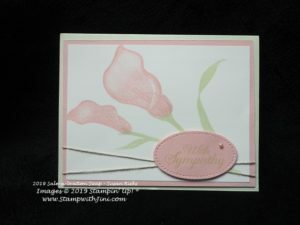 And how about this sweet little girl gate fold card done in Powder Pink? 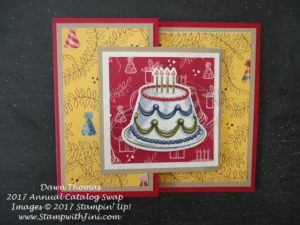 And here is a joy fold card using the cake image that has been cut out with the Framelits Dies. 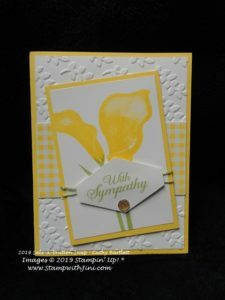 Fund, bright and colorful – and perfect for all kinds of cards as you can see! 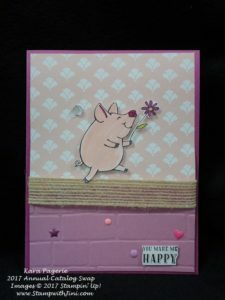 Today’s card is one that I made for my team Shoe box Swap this past Saturday. 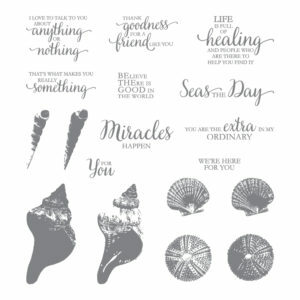 The So Many Shells was a stamp set I couldn’t pass up with it’s wonderful shell images. You know me I can never resist a set that is beach themed! 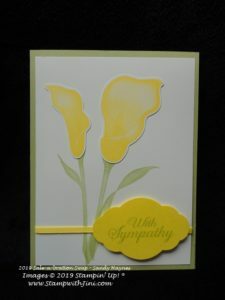 The sentiments in the set also cover a wide variety of needs which is always a bonus. Isn’t the font lovely? So here is the card I created. 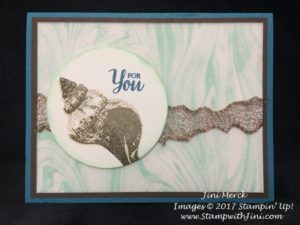 I stamped the Marbled Background onto Vellum to give it more of a translucent water feel to it. And I love the Copper Trim! Tug and pull and it turns into what looks like a net! Perfect for this project. 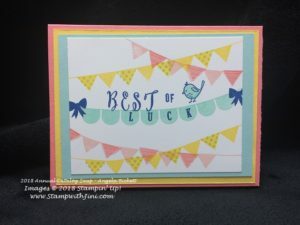 I hope you’ll enjoy making this card too. 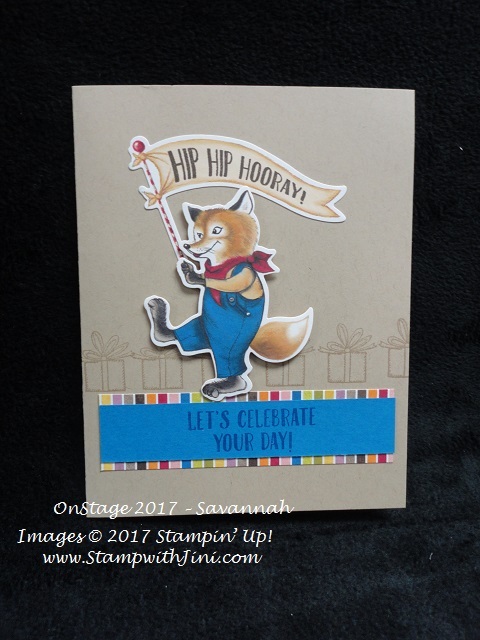 Here is my FREE Tutorial for the card. 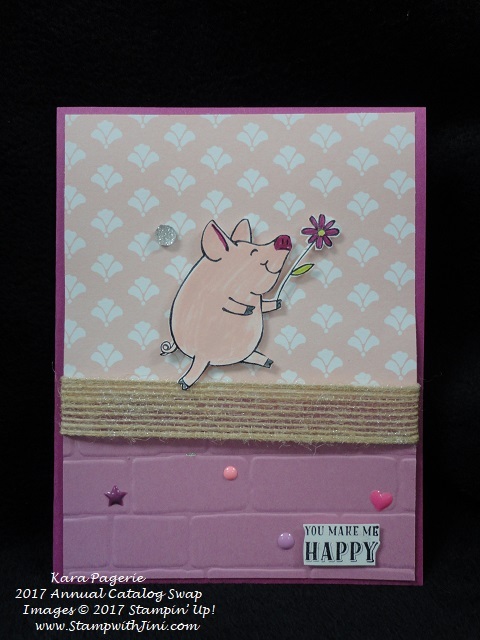 This first card from Linda packs a wow with the special fold and the Blushing Bride Glimmer Paper. Open it and you get a pleasant surprise! 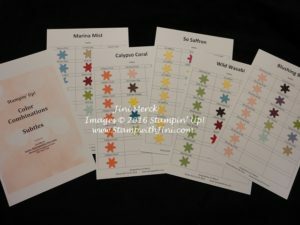 When you use the Hostess Code – I’ll send you this wonderful Color Combination Chart PDF which I created. This Gift includes a chart for ALL the Subtles and Brights! That’s 140 color combinations!!! 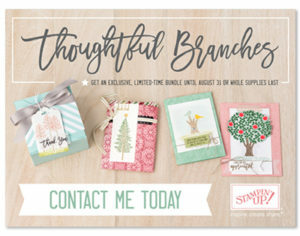 Exclusive Thoughtful Branches Stamp Set & Framelits Dies available while supplies last!